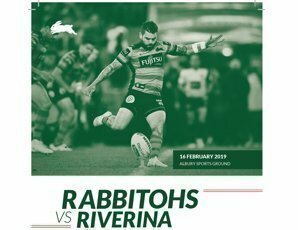 The South Sydney Rabbitohs are coming to Albury to take on the might of the Riverina in a trial match to be played at the Albury Sportsground, Saturday February 16. The main game will Kick Off at 6pm between the South Sydney Rabbitohs & Riverina. Purchase your tickets online now and support this fantastic event. Entry is permitted from the Botanical Gardens or Wodonga place gates. Hume Street Entrance will be open from 12pm. Botanical Garden entrance will be open from 4pm.